The revered economist's latest book, 'Discrimination and Disparities,' takes a look at the high cost of misguided policies aimed at achieving social justice. At 88 years old, Thomas Sowell continues to demonstrate why he’s one of the most formidable intellects of the age. 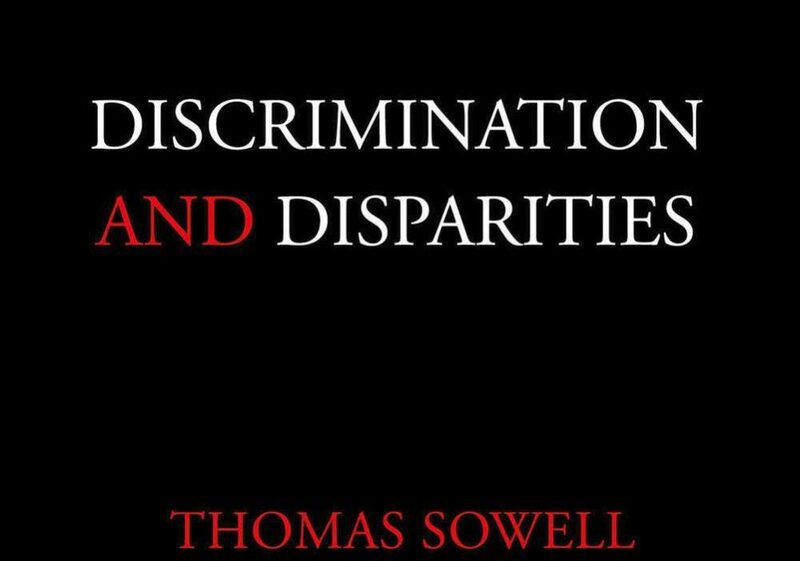 In Discrimination and Disparities, released earlier this year, Sowell rebuts common misconceptions regarding socioeconomic differences among individuals, groups, and nations, and demonstrates that disparities are often explained by economics. For instance, emotionally loaded phrases like “systemic racism” and “exploitation” are frequently used to explain differences between blacks and whites, rich and poor, and even individual nations. But a better understanding of economics refutes these notions. If you are walking at night down a lonely street, and see up ahead a shadowy figure in an alley, do you judge that person as an individual or do you cross the street and pass on the other side? The shadowy figure in the alley could turn out to be a kindly neighbor, out walking his dog. But, when making such decisions, a mistake on your part could be costly, up to and including costing you your life. In short, cost is the relevant factor when determining a course of action. The cost of Discrimination I—judging the person as an individual—may be prohibitively high in some cases, as when you approach a shadowy figure in a dark alley. But that does not mean that choosing to cross the street to avoid that shadowy figure is automatically Discrimination II—arbitrarily expressing antipathy toward a group. This is still Discrimination I, basing decisions on empirical evidence. But the distinction between the ideal version of Discrimination I—judging each individual as individual—and making decisions based on empirical evidence about the group to which the individual belongs is a consequential difference. We can call the ideal version (basing decisions on evidence about individuals) Discrimination Ia, and the less than ideal version (basing individual decision on group evidence) Discrimination Ib. But both are different from unsubstantiated notions or animosities. To take an extreme example of Discrimination Ib, for the sake of illustration, if 40 percent of the people in Group X are alcoholics and 1 percent of the people in Group Y are alcoholics, an employer may well prefer to hire only people from Group Y for work where an alcoholic would be not only ineffective but dangerous. This would mean that a majority of people in Group X—60 percent in this case—would be denied employment, even though they are not alcoholics. What matters, crucially, to the employer is the cost of determining which individual is or is not an alcoholic, when job applicants all show up sober on the day when they are seeking employment. [Cost] also matters to the customers who buy the employer’s products and to society as a whole. If alcoholics produce a higher proportion of products that turn out to be defective, that is a cost to customers … To the extent that alcoholics are not only less competent but dangerous, the costs of those dangers are paid by either fellow employees who fact those dangers on the job or by customers who buy dangerously defective products, or both. Consider, says Sowell, a real-world example. A disproportionate number of young, black job applicants have criminal records, meaning that employers may turn them down at a higher rate, even if they have zero animosity toward them (Discrimination 1b). Where the nature of the work made criminal background checks worth the cost for all employees, it was no longer necessary to use group information to assess whether individual young black job applicants had a criminal background. This made young black job applicants without a criminal background more employable than before. Moreover, understanding the economics is more than merely an academic exercise, when our understanding can make the difference between policies that hurt and help real people. Indeed, background checks have increased opportunity for black job seekers, yet many elites—including the U.S. Equal Employment Opportunity Commission—have tried to prohibit employers from conducting background checks by suing in the name of “racial discrimination.” If they acquainted themselves with the facts, however, they may realize the folly of their actions and emotionally charged rhetoric. Another oft-cited rationale for disparities is “exploitation.” Media and academia, for instance, have characterized stores that charge higher prices in high-crime neighborhoods as “consumer exploitation.” But, Sowell illustrates, businesses operating in high-crime areas often face punitive costs, including not only higher rates of theft, but, where high murder rates are concerned, danger even to their own lives. Simply delivering products to stores in crime-ridden areas entails steep costs, which are passed on to local consumers. Thus, despite what some academics have suggested, higher prices are caused not by greedy store owners who wish to exploit innocent consumers, but by criminal activity that raises the costs of operating business. Law-abiding citizens in these areas pay the price. As with forbidding background checks, misunderstanding the economics of this situation has led to counterproductive measures, including price controls. While studies reveal that rates of profit for businesses in high-crime areas are much lower than average, price controls prevent businesses from recouping their costs, meaning fewer businesses operate in these already sparse locations. While our intelligentsia may spout off against the evils of “racism” and “exploitation” and demand “solutions” like price and rent controls, they pay no price for the costs of their misguided policies. Local residents do, instead. Because they pay no price for the consequences of their rhetoric, or for the foolish policies that result from it, our media, academia, and political elite are likely to continue promoting unsubstantiated allegations like “racial discrimination” and “exploitation” as reasons for disparities among individuals, groups, and even nations. It is incumbent upon the rest of us, therefore, to learn the facts and refute such baseless accusations, and for that Sowell’s book is essential reading.